Scarring is the body’s response to trauma and is a part of the natural healing process. Apart from trivial abrasions to the skin, an accident, surgery or disease can result in scarring. Scar tissue can form in internal organs, for instance, in the heart muscle, as well as on the skin. Scarring is a normal healing process in which scar tissue comprising of collagen, a type of protein, has a single direction alignment as opposed to the basket weave alignment of normal tissue and is of a poorer quality. Coupled with smaller amounts of elastin, another type of protein, resulting in less elasticity, scar tissue can often appear raised and unsightly (Dallon, 1998). The first section of this article covers different types of scar tissue, whilst the second section explores conventional treatment interventions, and how therapies such as aromatherapy may complement them. Suggested blends are provided to help reduce the risk of scarring as opposed to removing scarring, which are difficult to remove even with conventional treatment. The third section offers a list of organisations, who can provide support and advice to those affected by scarring. Normal fine-line scars occur following a minor wound such as a cut or following surgery. The scar will appear as red, raised line initially and may itch for a few months, but will get paler and flatten out over time. This may take up to two years, and you will still be left with a visible line. Keloid scars are generally seen in individuals with a darker skin pigmentation and may be caused by surgery, accidents or acne. This type of scar is raised and is red or purple at first becoming paler over time. Keloid scars can also be itchy or painful and may cause restriction in movement if tight and close to a joint. Like hypertrophic scarring, keloid scars result from an overproduction of collagen. Unlike hypertrophic scars however, they can grow outside of the wound area, becoming much larger than the original injury. The scars tend to appear and grow slowly, with some taking between three and twelve months to appear, and sometimes continuing to grow for years. The scar tissue can be itchy, tender or painful to touch whilst growing but remains benign and completely harmless. They are generally regarded as a cosmetic problem, and surgical removal can make the problem worse (NHS, 2017). Atrophic scars, also known as pitted or sunken scars, are indented scars where healing has occurred below the normal layer of skin tissue, and where the tissue is unable to regenerate. They can be caused when fat or muscle tissue are lost through accidents or surgery, or after severe acne or chickenpox. 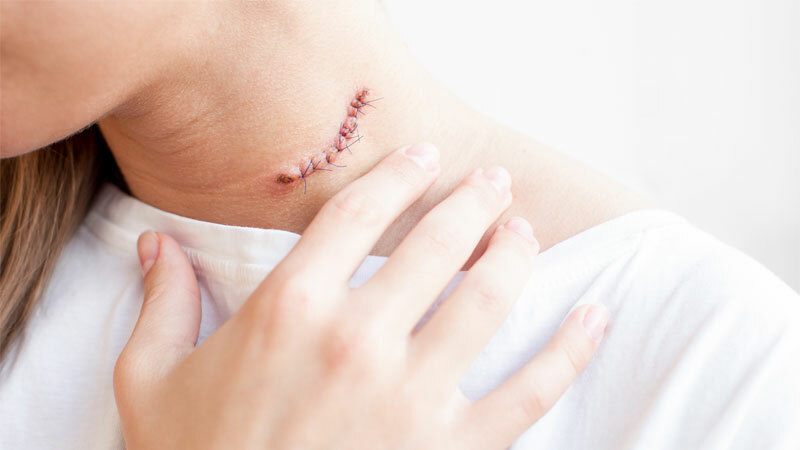 Scar contractures may be caused by surgery or after second or third-degree burns. As the affected area begins to heal the surrounding skin pulls together and contracts resulting in tightness and movement restriction (NHS, 2017). Stretch marks are a type of scarring, caused when the skin is rapidly stretched through, for example, rapid weight, body-building or pregnancy. They can also occur during puberty. They appear as long, thin, red or purple lines that fade over time to a silvery-white colour, and typically occur in areas where fat is stored, such as the tummy, breasts, upper arms, thighs and bottom (NHS, 2017). While most scar tissue will fade and become paler, it is not possible to remove completely. Nonetheless, there are several conventional treatment interventions available that can help make the scar tissue less noticeable or reduce restriction and discomfort, such as topical silicone gel, pressure dressings, camouflage make-up, surgery and medication (NHS, 2017). However, complementary treatments, such as aromatherapy may also help reduce scarring by facilitating the healing process as well as lessening the appearance. Furthermore, essential oils can help reduce some of the emotional impacts of scarring, such as anxiety and depression. The use of aromatherapy is discussed in more depth below. Gattefosse, a chemist, credited with coining the word ‘Aromatherapy’ in the 1920’s, burnt his hand badly in a laboratory explosion and plunged it into some neat Lavender oil, it healed exceptionally fast, did not become infected and left no scar. This led him to develop the use of essential oils in dermatology and undertake a great deal of research into their medicinal uses (Davis, 1999). There is a plethora of anecdotal evidence suggesting that Lavender (Lavandula angustifolia) essential oil is an effective remedy for burns, helping to reduce pain. These claims can be supported by evidence-based research. For example, results from a single-blind trial in which 90 patients, with less than 20% burns, showed that aromatherapy massage and inhalation aromatherapy had a positive effect on reducing both anxiety and pain of burn patients in comparison to the control group. (Seyyed-Rasooli, et al., 2016). Additionally, combining essential oils with massage may reduce scar tissue. A systematic review of literature assessing the efficacy of scar massage in hypertrophic burn scars indicated that massage may be effective in reducing both physical and psychological impact of burn scarring. However, the review highlighted the inferior quality of evidence and absence of consistent and valid scar assessment tools, and recommended that controlled clinical trials are undertaken to develop evidence-based guidelines for carrying out massage on hypertrophic scarring (Ault & Paratz, 2018). In another study, it was demonstrated that Lavender oil has the potential to promote wound healing in rats, thus suggesting that it may be used effectively alongside conventional therapy in the treatment of wounds (Mori, Kawanami, Kawahata, & Aoki, 2016). Anecdotal evidence suggests that Chamomile (Anthemis nobilis), Clary Sage (Salvia sclarea), Frankincense (Boswellia carterii), Helichrysum (Helichrysum italicum), Lemon (Citrus limon), Mandarin (Citrus reticulata), Neroli (Citrus aurantium), Rosemary (Rosmarinus officinalis ct. cineole) and Tea Tree (Melaleuca alternifolia) may be of benefit. These essential oils may be blended with carrier oils such as Rosehip seed (Rosa canini) or infused oils such as Calendula, both of which are also reputed to be helpful in skin regeneration. People living with scarring may suffer from mental health disorders such as anxiety. Studies show that inhaling essential oils such as Sweet Orange (Citrus sinensis) may help with these conditions. For instance, in a study forty male volunteers were allocated to different groups for the inhalation of Sweet Orange essential oil, Tea Tree essential oil, or water. While more studies were recommended to establish the clinical relevance of aromatherapy for anxiety problems, the results showed that Sweet Orange had acute anxiolytic activity (Goes, Antunes, Alves, & & Teixeira-Silva, 2012). Run the affected area under cold water for at least 10 minutes and apply a few drops of neat Lavender essential oil to the skin. Mix 2 drops of Mandarin essential oil with 10ml of Calendula infused oil and massage gently into affected areas once a day. Cleanser: Mix 2 drops of Neroli and 4 drops Lavender with 10ml of our Cucumber Cleanser. Use morning and night. Toner: Use Orange Flower Hydrolat after cleansing. Moisturiser: Mix 2 drops of Neroli and 4 drops Lavender with 10ml Organic Moisturising Lotion and apply morning and night after cleansing and toning. Mix 2 drops Clary Sage, 8 drops Roman Chamomile and 4 drops Frankincense with 30ml Rosehip Seed oil. Massage into the affected area twice a day. Do not apply to an open wound or incision until after the stitches/steri-strips have been removed. Make up a blend of 4 drops Sweet Orange, 8 drops Geranium and 2 drops Frankincense and place a few drops into an aromatherapy diffuser or candle burner, or pop a couple of drops on a tissue and inhale as required. Alternatively you can blend the oils with 30ml of Rosehip Seed Oil and add 5ml to your bathwater. Relax in the bath for a minimum of 15 minutes inhaling the aroma. A complex biological process takes place during inhalation of the blend which may result in an improved emotional equilibrium. All of the above mentioned oils and other products can be purchased via our website. Complementary therapies such as aromatherapy can benefit people living with scarring both physically and psychologically. Some essential oils may be used to aid the healing process and improve the appearance of scarring, whilst others may promote a sense of wellbeing and reduce anxiety disorders. Goodman, G. J. (2000). Postacne Scarring: A Review of its Pathophysiology and Treatment. Dermatologic Journal, 26(9), 857-871. doi:Goodman GJ (2000). "Postacne scarring: A review of its pathophysiology and treatmendoi:10.1046/j.1524-4725.2000.99232.x.